The Czech Republic is viewed by many people as a country with a very long and friendly relationship with Israel. The era of Communism, when Czechoslovakia was under Soviet influence, cannot be included in this respect, because an independent sovereign foreign policy was then virtually impossible. For most of the time between 1948 and 1989, the Soviet Union maintained close relations with Arab countries hostile to Israel, and Moscow’s satellites were forced to apply the same policy in the Middle East. As Czech security analyst Irena Kalhousová observes, “After the fall of the Berlin Wall, good relations with Israel became a symbol of the formerly Communist countries’ freedom and also a confirmation of their Atlantic position.” Yet, she adds, the Czech Republic is an outstanding case. Is there any explanation of such extraordinarily good relations with Israel? We can find the answer in modern Czech history. In this paper, I would like to focus on the most important moments in the history of Czech-Israel relations. The Czech lands gave the world many notable supporters of Israel and the Zionist movement. Three of these supporters, in particular, are considered to be the most important for the positive development of relations with Israel and they deserve our attention. The first one is the first Czechoslovak president Tomáš Garrigue Masaryk; the second is his son Jan Masaryk; and last, but not least, is Václav Havel, the first democratic president after 1989. All of them were great personalities who played an immensely important role in Czech history, and they were all friends of the Jewish nation. Thanks to these three figures, the history of freedom and democracy in Czech lands is also a history of good relations with Jews and Israel. In the first half of the 20th century, the first Czechoslovak President Tomáš G. Masaryk was well known for his sympathy toward Zionism. Moreover, long before he became president, he had fought anti-Semitism in the Hilsner Affair in the early 1900s, when Leopold Hilsner, a Jewish vagrant, was falsely accused of murdering two young non-Jewish women for ritual purposes. He was also a staunch sympathizer of the Zionist movement and pleaded for the creation of a Jewish state. It is also worth mentioning that in 1927 he was one of the first state officials to visit the then-British mandate of Palestine. This event was undoubtedly a great moment for the Zionist cause, even though his visit was unofficial. Thus, the roots of Czech strong pro-Zionist, or pro-Israel, sentiment lie in the thoughts and policies of Tomáš Garrigue Masaryk, who influenced the way of thinking of future generations of democratic politicians in the Czech Republic. The commencement of very close relations between Czechoslovakia, or the Czech Republic, with Israel dates back to tumultuous times before the establishment of the Jewish state. Jan Masaryk, son of Tomáš Garrigue Masaryk, and then foreign minister, followed in his father’s footsteps. He was also an ardent supporter of the Zionist cause, and in 1947 Czechoslovakia was one of 33 countries to vote in favor of the UN partition resolution recommending the establishment of a Jewish state. Czechoslovak support for Israel continued even after the Communist putsch in February 1948. On May 18, 1948, four days after Israel’s declaration of independence, Czechoslovakia was among the first countries to recognize the State of Israel. Diplomatic relations between the two countries were established on July 3, 1948. Czechoslovakia provided not only political but also military support, which was crucial for Israel’s victory in the first Arab-Israeli War. Under an embargo imposed by the United Nations, the Jewish forces were short of arms and ammunition, and Czechoslovakia was then the only country willing to sell weapons to the Yishuv after World War II. The newly established Israeli state, therefore, bought military aircraft and weapons from Czechoslovakia. Twenty-five Avia S-199 fighters, 61 Supermarine Spitfire fighter aircraft, and other weapons and ammunition were sold to Israel. The exact numbers are hard to find due to lack of records, but during the year 1948 Israel purchased from Czechoslovakia 34,500 Mauser P-18 guns, 20,000 bayonets, almost 50 million bullets, 5,515 Spandau MG-34 light machine guns with 10,000 ammo belts, 500 ZB-26 light machine guns, 900 ZB37 heavy machine guns, and 500 CZ vz. 27 pistols with ammunition. Another problem Israel had to face, beside the arms shortage, was the shortage of trained and experienced air force pilots. Training Israeli pilots in Czechoslovakia was thus also highly important for the new Israeli army. Specifically, 82 pilots and 69 ground specialists were trained in Czechoslovakia. Training was conducted in air bases in České Budějovice, Hradec Králové, and Prostějov. Many of these pilots later became part of the First Fighter Squadron of the Israeli Air Force. One of these people was the future commander of the Israeli air force and Israel’s president Ezer Weizman. However, in February 1948, Communists seized power in Czechoslovakia, and the country fell under the Soviet sphere of influence. Under these circumstances, Czechoslovak support for Israel had to conform to the Kremlin’s political line. An independent foreign policy in the Eastern Bloc was nearly impossible. After 1948, it was becoming obvious that Israel would not become a part of the Eastern Bloc, and Israel-USSR relations began to deteriorate. In the eyes of the USSR, Israel ceased to be an ally and became an agent of American imperialism in the Middle East. A logical consequence of this development was that support for newly established Israel was denied and former Soviet support for Zionism turned into open enmity. Anti-Zionism became common all over the Eastern Bloc, and even Czechoslovakia did not avoid it. In this respect, the infamous Slánský trial of 1952 must be mentioned. Rudolf Slánský was secretary-general of the Communist Party of Czechoslovakia, and the second most powerful man in Czechoslovakia after President Klement Gottwald. His Jewish origin was one of the main reasons why he was chosen to be the showcase in this show trial. Along with 13 other high-ranking Communist officials (11 of whom were also of Jewish descent), he was accused of a Zionist-Titoist-Trotskyist conspiracy and charged with high treason. All the defendants were forced to plead guilty for spying, treason, sabotage, and disclosure of military secrets. In this show trial, Rudolf Slánský and 10 other accused people were sentenced to death and hanged. The remaining three people received a life sentence. Show trials like this were not uncommon in the Eastern Bloc. They were inspired by trials in the USSR, and similar trials had also been staged in Poland, Hungary, and Bulgaria. Anti-Semitic moods were on the rise at that time, and Czechoslovakia’s Communist government blamed Israel for disrupting the Czechoslovak state and its economy. That was the reason why two Israelis, Simon Orenstein and Mordecai Oren, were arrested and forced to testify in the Slánský trial. Eventually, both were found guilty of being agents of Western imperialism and traitors to the Communist regime and sentenced to many years of imprisonment. 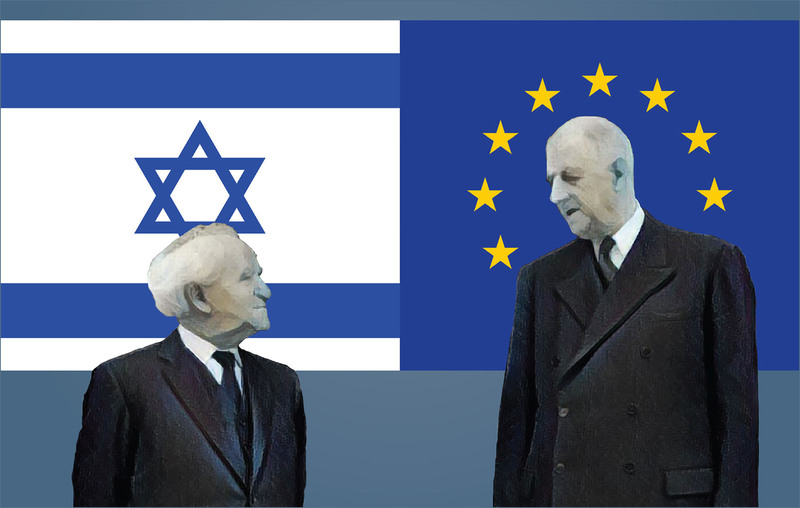 Fortunately for both of them, the former was released and expelled to Israel in 1954 and the latter two years later. Another blow for relations with Israel came in 1967. All the Communist countries in the Soviet Bloc except Romania completely severed their diplomatic ties with Israel after the Six-Day War. For this reason, for more than 20 years, there were no official relations between Czechoslovakia and Israel. These years belong to the darkest chapters of modern Czech history and Czechoslovakia-Israel relations. The fall of Communism in 1989 was the beginning of a new chapter in Czechoslovak- (and later Czech-) Israel relations. The election of Václav Havel on December 29, 1989, itself was a turning point. Three days after his election, the new Czechoslovak president said in his New Year address that he would be happy if diplomatic relations with Israel were established before the elections. His wish was fulfilled soon thereafter. In those euphoric times, diplomatic ties were renewed in February 1990, and two months later, President Václav Havel was the first head of the post-Communist countries to visit Israel. “As a newly forming democracy, we sympathize with Israeli democracy,” Havel said on the occasion of the reestablishment of relations with Israel. He also appreciated the contribution of Jews to Czech and Slovak culture. Václav Havel followed the legacy of Tomáš G. Masaryk, who was not afraid to act in the Hilsner affair and stood up decisively against anti-Semitism. We can say that Havel continued with the friendly policy toward Jews and Zionism set by both Tomáš G. Masaryk and his son Jan Masaryk. After Václav Havel, his successors Václav Klaus and Miloš Zeman continued in his pro-Israel policy. The same applies to all governments since 1989. Close and outstanding relations with Israel are a priority and where there is a unanimous consensus between democratic parties it does not matter who is in power. The Czech Republic is one of the closest allies to Israel within the European Union, where a friendly attitude toward Israel is not common. Here are a few recent examples of Czech support for Israel: In 2006, when Israel fought Hizbullah, the Czech Republic, unlike many EU countries, stressed the right of Israel to defend itself. More than two years later, at the turn of 2008–2009, the Czech Republic was also one of the few countries that did not condemn Israel’s Operation Cast Lead against Hamas in Gaza. And when it comes to voting in the UN General Assembly, the Czech Republic is one of a few countries that usually does not vote in favor of anti-Israeli resolutions. Not only political, but also economic relations have been flourishing since 1990. Israel is a producer of cutting-edge technologies and thus a very attractive business partner for many Czech companies, while on the other hand, strong relations with the Czech Republic are strategically important for Israeli companies. The Czech Republic allows Israeli companies to enter the European market. Recent military cooperation must be mentioned, too. For instance, in late 2008, Israel was the only country that agreed to help train Czech helicopter pilots and crews in desert conditions for their upcoming mission in Afghanistan. The training was conducted in the Negev Desert. Israel considered this an opportunity to express its gratitude to the Czechs for training Israeli pilots during the first Arab-Israeli war. Even though the geographical distance between the two countries is more than 2,600 km, we cannot find a European country with closer relations with Israel than the Czech Republic. Maintaining and strengthening the existing ties between the Czech Republic and Israel is desirable and necessary. Good mutual relations are, in many aspects, in the best interest of both democratic countries. Tomáš Zdechovský is a Czech politician, crisis manager, media analyst, poet, and author. In May 2014, he was elected Member of the European Parliament with KDU-ČSL, which is part of the European Peoples Party.